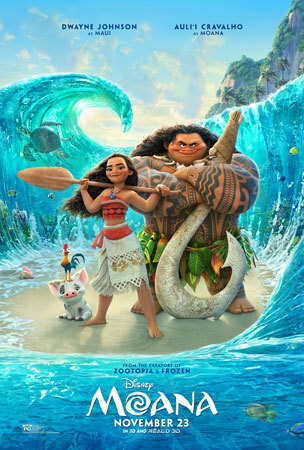 The new Disney animated musical film Moana explores the vast Polynesian islander culture. Ancestors were explorers and wanderers, sailing across strange waters to discover and settle many of the islands we know today. 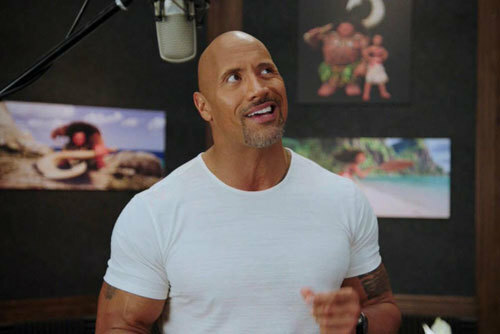 As most people know, Dwayne “The Rock” Johnson has Samoan ancestry so he was a natural voicing (and singing) the role of Maui, a demi-God who slowly becomes an ally of Moana, a beautiful daughter of island royalty who has always been “called” by the sea for an adventure that will save and rejuvenate her people. Voicing and singing as Moana is talented just turned 16-year-old Hawaiian Auli’I Cravalho who was discovered in Oahu while singing at a charity competition. Lin-Manuel Miranda is seen everywhere lately since he wrote and performed the hugely popular, Tony-winning rap musical “Hamilton” about one of America’s founding fathers. He wrote and sings several songs in Moana. Check out what these cool talents had to say about working on the movie. Q: Auli’i, you are a pacific islander from Hawaii and Dwayne, you have Samoan roots. Talk about your roots in the culture. Auli’i: I’ve grown up in Hawaii all my life. I grew up in a small town on the big Island of Hawaii, where I literally grew up with pigs and chickens (Like Moana does in the film). I am deeply rooted to my culture. I actually go to an all-Hawaiian school where the mythology and the folklore of Maui is in our curriculum and I’ve listened to those stories as bedtime, you know, stories and I’ve grown up with the spirits just around me and I’m sure Dwayne can second that. Dwayne: Yes, you know, what Auli’i just said, “Aloha Spirit” is something that is very special, it’s very meaningful to us and our Polynesian culture. It’s a very special thing. It’s an intangible, that when you get off the plane and you have your feet on the ground there, energetically it takes you to a different place. That’s Aloha Spirit. And you know, the opportunity that we had, just as Polynesians to bring to life a story of our Polynesian culture in this capacity and musically with these masters, was just a really, really special opportunity for us. Q: Lin, Disney took you to a Pacifica Festival to get an idea of the kind of music that comes from Polynesian islanders. Can you talk about that? Lin-Manuel: Yeah, sure. With my job offer (to provide some music for the movie) came a plane ticket to New Zealand where everyone was already there and you know the Pacifica Music Festival is islands and choirs from all the different islands in the Pacific so we sort of immersed ourselves in this world and then (we) jumped into a studio and just started banging on drums and really trying to find the pulse of this thing in a way that honored the unique musical heritage and incredible rhythms that come out of this part of the world. Q: We hear you won a dance competition at the festival too, right? Lin-Manuel: Yes, Luckily Puerto Ricans can shake their hips, too (laughter) so I won. 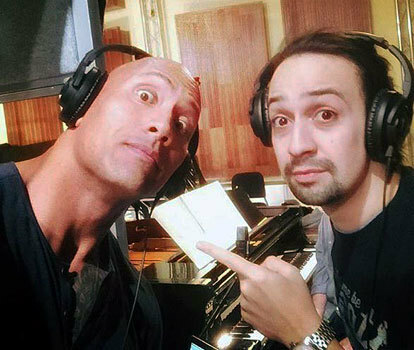 Q: Lin-Manuel, you got “The Rock”, Dwayne to sing and sing very well in this movie. How did that happen? Dwayne: You couldn’t get me to shut up. 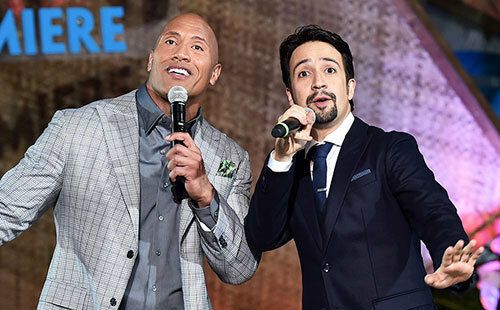 Lin-Manuel: When Dwayne accepted the role he said, “So what are you giving me to sing?” and he was really excited for this. I went to YouTube (for research). I’m a big fan of his wrestling days and there was a time during your heel turn era where you would pull out a guitar and taunt whatever town you were in. He’d be like, “Can’t wait to get out of Chicago”. I can’t do the eyebrow thing he does. So, I got a really good sense of his vocal range and then the rest of it was just writing lyrics that embody the spirit of Maui, who is this amazing demi-god, trickster god and once I had the title, “You’re Welcome”, which only Dwayne can pull off and still have you love him and root for him, we were off to the races. Dwayne: Look, man, it was an opportunity to challenge myself. Lin did his research and by the time I got the song, it was in my comfortable range as well and then also parts of the song which pushed me a little bit, which I appreciate because that’s what I needed vocally. I had such a great time, one of the best times I’ve ever had in my career was actually working on this project and certainly working on that song because this was a challenge that the bar is set so incredibly high in a Disney film to sing. It’s historical. Q: Lin-Manuel, If a young person really likes to write or song-write, what advice would you give? Lin-Manuel: Keep writing. Don’t stop writing. When you start writing you’re turning on a faucet and when you turn on a faucet the water’s brown and it’s full of whatever’s just been in there and clogged up and waiting to come out and then you just keep writing and writing until the water’s clear and that’s when you find your own voice. Keep writing. Q: Cool advice! How did you get into Moana’s head for the music she sings? Lin-Manuel: I will admit the first time I sat down at my piano to work on something for this I remember thinking, “Don’t think about “Let It Go”, don’t think about “Let It Go”!” but you solve that problem by just really, really getting inside the heads of your characters and my way into Moana, in particular was that the way she feels the call of the sea is the way I felt about writing music and making movies and singing songs when I was 16 years old and living on 200th Street in Manhattan and thinking, the distance between where I am and where I want to be seems impossibly large and so I got myself into that mindset to write her songs. Q: Auli’i, this is your first time in a film and it’s a big one. How did you feel about voicing the lead in a big Disney animated movie? Auli’i: It’s just been an incredible journey for me. I’m 16. I’m working with the best people in the entire world who are making a film inspired by my culture, the culture that I have lived every day of my life and that is something so incredibly special for the rest of the world to see. As someone who is hoping to continue in show business, now that I’m in show biz, I was wondering, how would I continue in this and still be Polynesian? As I potentially might leave my home, what does that make me? Am I still grounded and rooted in the way that I want to be? Yes, because being surrounded by my family and by the Hawaiian culture every day, it seems as though I would never lose it. (I hope the character of Moana) will inspire others as well, to become rooted in who they truly are. Q: Cool. Dwayne, what do you think the message in this film is? Dwayne: Regardless of where we’re at in the world, where we’re from, cultures, class, religion (most important) is your inner voice. Our world today is so full of noise. There’s so much noise that’s happening in our world, but the little voice that you’ve always got to listen to, your gut, your intuition (that says) you can do things, you can go beyond boundaries and you have to trust that gut and instinct. So those are the things I feel like our (Polynesian) people are going to take away and the rest of the world will take away. Q: You all have seen the film now. What was special about it for you? Dwayne: I was so moved when I saw the movie, for a variety of reasons, not only you work on it, you pour your heart and soul into it but it’s culture. The grandmother in the movie, Gramma Tala is like my grandmother, like so many of our grandmothers and when I saw it in a theater, in a very little theater, with a group of people, what I noticed is people were just floating (with joy) when they walked out of the theater and it was such a cool thing to be a part of. 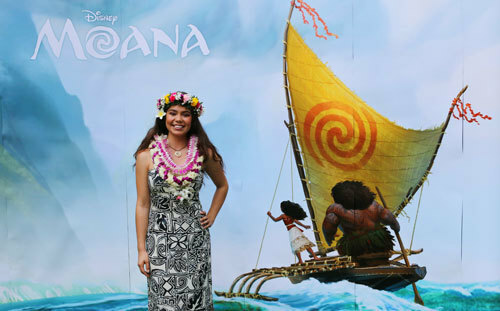 Auli’i: I’ve been voicing this character for a little bit over a year now and I’ve known how incredible Moana was. But that was me in a booth and to see her on screen, she kind of has some characteristics of me in her face, she’s a little bit like me to have my voice in there, it’s a little uncanny. But also to hear how the characters play off of each other; that was really incredible for me and especially Gramma Tala, that was a challenge for me to record because I like being happy and having to challenge myself and go into that deeper place was challenging but so rewarding. I didn’t get to really connect to my grandmother before passed, unfortunately, but I have the best mom in the world. Q: Did she inspire you? Auli’i: Whenever I thought of someone who pushed me a hundred percent and loved me unconditionally and still does and still will for the rest of my life, that, that’s my mom. So to see that character relationship play out the way I felt it in the booth and to see my mom’s reaction to the entire film, I loved that. It was, it was just an amazing experience seeing the finished film. See Moana in theaters now! Do you love Disney musicals like "Frozen"? Have you been to Hawaii or a Pacific Island? Talk about Moana below. How Do You Say "Hello" in Hawaiian?